What Happens if Lab-Grown 'Brains' Start to Think? But minibrain research is progressing so quickly that scientists need to start thinking about the potential implications now, says Nita Farahany, a professor of law and philosophy at Duke University and the director of Duke Science and Society. "Is it possible that an organoid far off in the future could develop something that looks like consciousness or any kind of sentience, the ability to feel something like pain," she says. Farahaney and 16 other prominent scientists, ethicists and philosophers posed this question and many others in a commentary in this week's issue of the journal Nature. 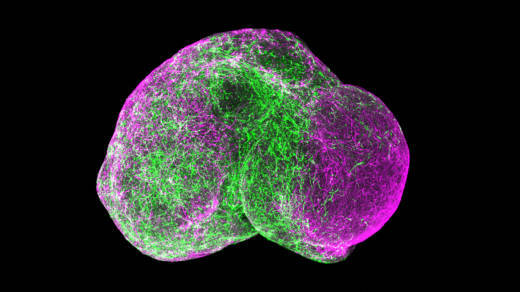 Minibrains are usually created by transforming skin cells from a person into neural stem cells. These stem cells can grow into a range of structures like those found in the human brain, and even form networks of cells that communicate. At the moment these lab-grown minibrains are limited to a few million cells and don't get much larger than a pea. In contrast, the human brain is thousands of times larger and contains about 85 billion cells. "Right now they're pretty good proxies for being able to study how certain kinds of human neurons interact with each other and grow and develop over time," Farahany says. "But they are still far from what an actual human brain would look like." Yet already, minibrains are helping scientists do remarkable things, Farahany says. "If you're talking about something like schizophrenia or autism, if you want to model those things, it is difficult to do so with animal models and it is ethically impossible in many instances to do so with living humans," She says. But it is possible to grow a minibrain from cells with genetic mutations associated with like autism and watch how it develops. Minibrain experiments also helped scientists figure out how the Zika virus interferes with normal brain development, Farahany says. And just this month, a team at the Salk Institute in La Jolla, Calif., published evidence that a human minibrain transplanted into a mouse brain could develop functioning blood vessels. That would, in theory, allow scientists to grow much larger minibrains. So it's clear the potential of the field is huge, Farahany says. But so are the ethical questions surrounding brain cells that live and grow outside the human body. One area of concern involves the practice of transplanting human brain tissue into animals. That could eventually lead to, say, mice with exceptional mental abilities, Farahany says. So now, she says, is when scientists and society needs to start asking questions like, "How comfortable are we with certain kinds of hybrids we're creating and does that change the way we regard those animals or the kinds of protections that should be afforded to them." For example, researchers may need some guidance on what research rules apply to enhanced lab mouse, Farahany says. Do they assume it's like a typical lab mouse, which can be killed at the end of an experiment? Or do these mice enjoy the protections given to chimps, which are allowed to retire after their time in research is done? The commentary doesn't offer answers to those questions, or any specific guidelines for research. Instead, it is intended as a way of guiding future discussions about minibrains and other efforts to replicate the functions of a human brain. "This is really the time to get out ahead of these ethical issues before it becomes deeply problematic to proceed without having addressed them," Farahany says.